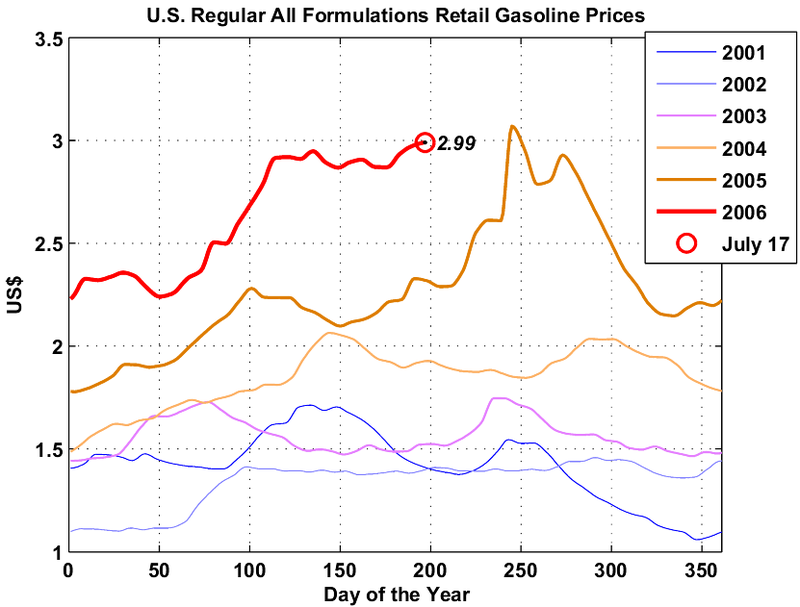 GraphOilogy: Are Prices Affecting the Gasoline Consumption in the US? Are Prices Affecting the Gasoline Consumption in the US? Now that prices in the U.S. have nearly doubled since 2001 (see Fig. 1), I was wondering if gasoline consumption has been affected. Fig 1. 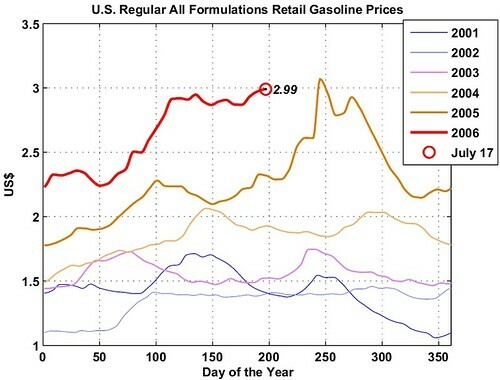 US Retail Gasoline Prices (EIA, April 21, 2006). Fig 2. 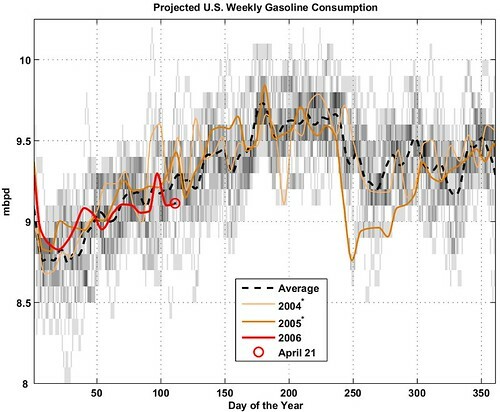 US Gasoline Supplied (EIA, April 21, 2006). Once the linear trend is removed (Fig. 3), it's then easier to deal with the seasonal pattern. Fig 3. 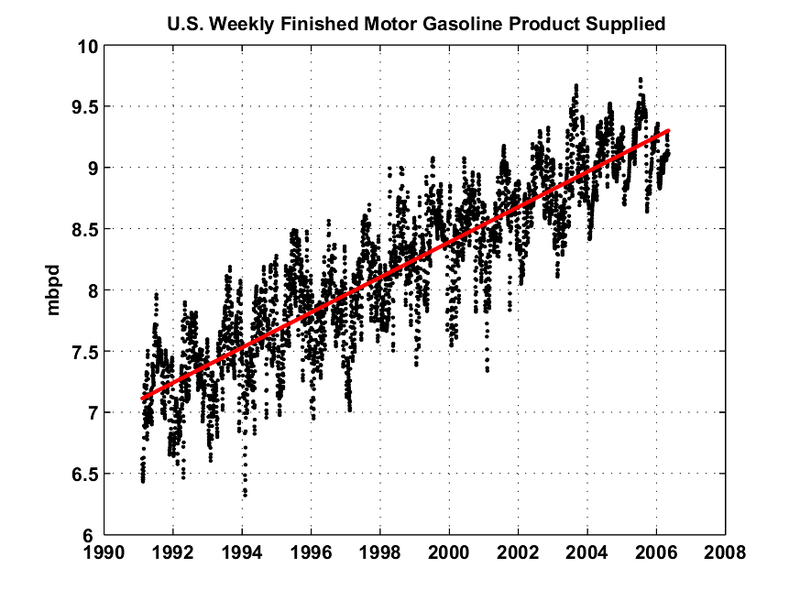 Residuals of US Gasoline supplied after the trend has been removed. 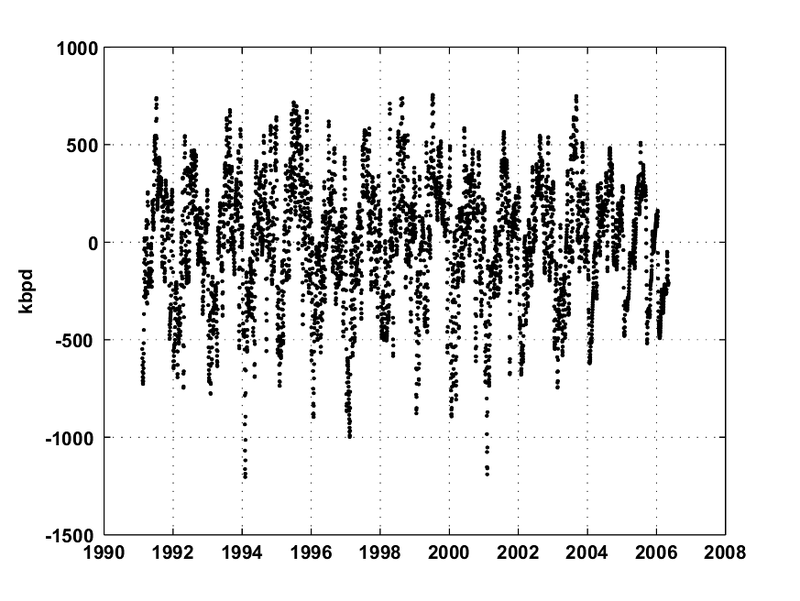 From the above residuals, we compute the frequencies of the observed residual values (histogram) for each day of the year as shown on Fig. 4. We can clearly observed the increase in gasoline consumption during the driving season. To have a rough idea of what we should expect for 2006, we use the linear trend line to adjust the seasonal pattern and the 2004 and 2005 consumption values. Fig 4. 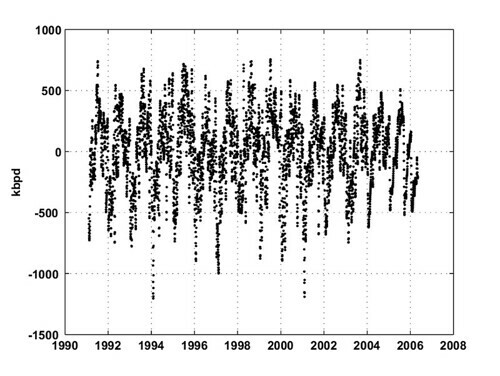 The gray level image in the background is the observed seasonal fluctuations derived form the residuals shown on Fig. 3 (darker areas mean more frequent values). The red curve is the observed data for 2006. The * means that the data for the year 2005 and 2004 have been adjusted to match the yearly consumption for 2006 given by the linear model (red line on Fig. 1). 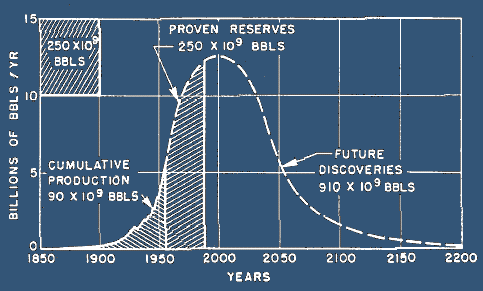 The dark dotted line is the average fluctuation. So far, the gasoline consumption levels don't seem to be out of the range of what have been observed in the past despite being below the average consumption for that time of the year. Notice also how significant was the big drop in consumption last year after the hurricanes Katrina and Rita.